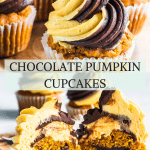 These are my Chocolate Pumpkin Cupcakes making an appearance at our beloved #cupcakemondays. My son Luke and I got in the kitchen on Saturday afternoon to make these cupcakes together. My son Luke is 2 and a half years old. He loves baking with me. So we are always in the kitchen together. Which takes an enormous amount of patience, but can be the most fun thing in the world. Watching my son learn how to bake, how to use the kitchen tools, how to say the names of the ingredients, that’s the coolest thing in the world for me. 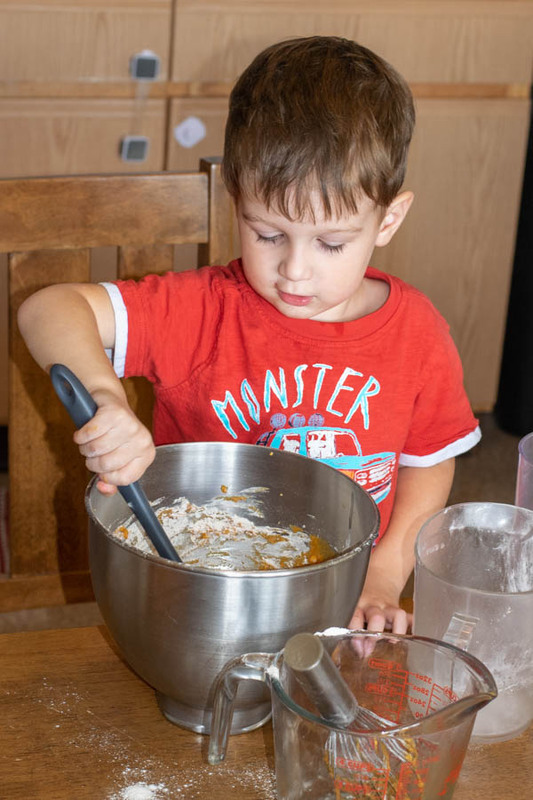 I hope and pray that Luke will want to cook with me as he grows older, because I have the best time baking with him. Watch him, he is always so focused on learning and doing a good job at his task. If you follow my instagram, or my other blog posts, you’ll often see Luke make an appearance. 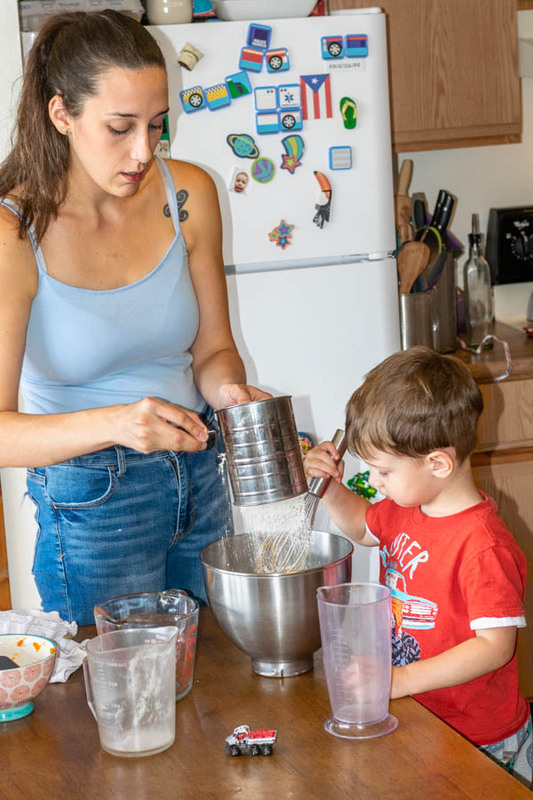 Since he could sit up by himself, I’ve been trying to involve him in my baking adventures. Anyway, so today we can attribute the deliciousness of my Chocolate Pumpkin Cupcakes all to Luke’s magic touch. 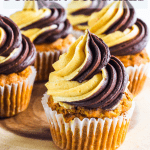 Let’s quickly talk about the frosting and how to obtain that swirl effect. How to make a bicolor swirl with frosting? Simply place each frosting in an individual piping bag. And cut a hole at the end. 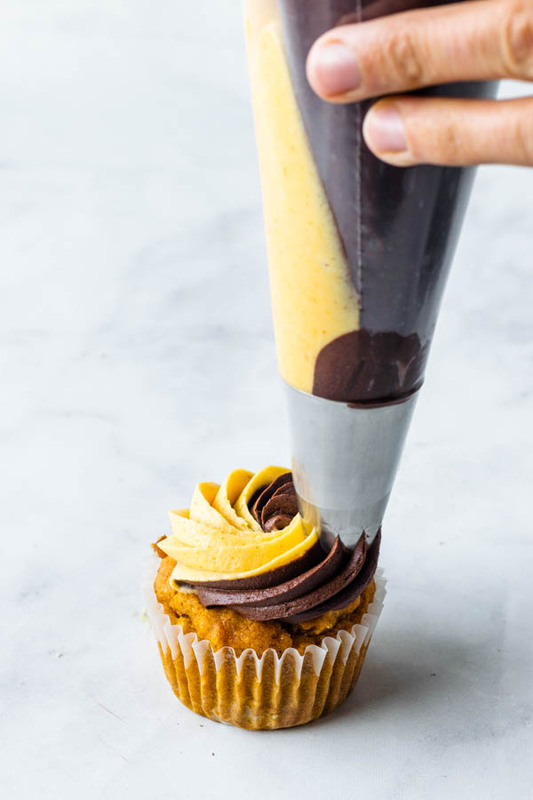 Now, line a large piping bag with the tip of choice to frost your cupcakes. Insert both frosting bags inside of the third piping bag. And this way, when you pipe, your work will look like this. I am using a Ateco 829 Pastry Tube – Star – Size 9 for the frosting. Which happens to be one of my favorites. 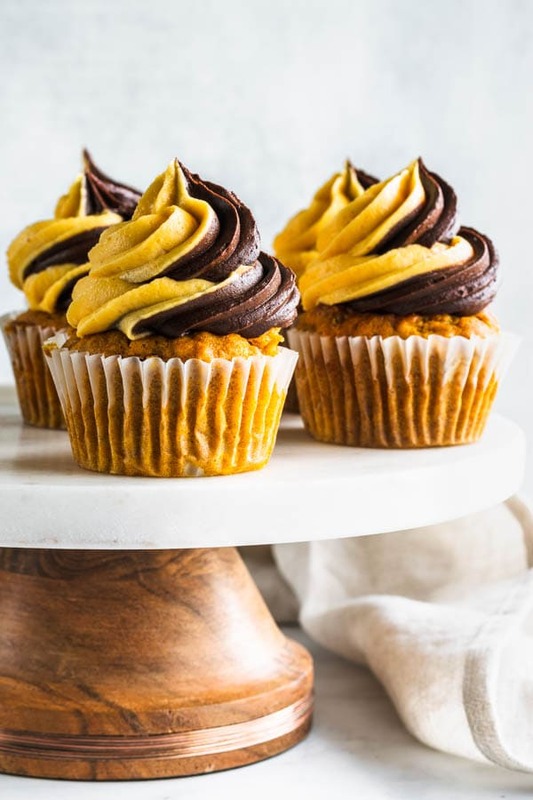 If you look at my previous cupcakes, you will see that I always try to put something on top of my cupcakes that’s going to make them special. Such as a Lindor truffle on top of my Lindt Cupcakes, or a macaron like in the case of these Matcha Cupcakes, or even a cinnamon roll, like my Cinnamon Roll Cupcakes. And these are just a few examples, you can check out some more cupcakes here. 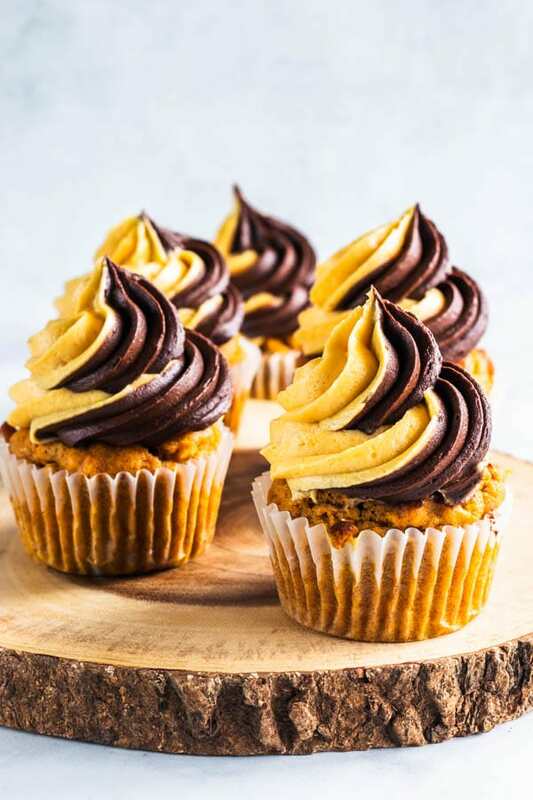 However, with these Chocolate Pumpkin Cupcakes, not only did I have no idea of what to put on top of my cupcakes, but also, I kinda thought the swirled frosting would be special enough and could hold the stage. Now you tell me, what do you think? Do you prefer the over the top cupcakes, or you are more of a simply frosted cupcakes type of person? So, when I was trying to think about what kind of chocolate frosting to help make this beautiful swirl, I wanted to go with a very dark, shiny chocolate frosting. And I decided to go with this Fudge Chocolate Frosting. Super easy to make. Seriously delicious! Which also made me decide to fill the cupcakes with the frosting, since a little chocolate overdose can never hurt anybody. And I am pleased with all of my decisions concerning these delicious Chocolate Pumpkin Cupcakes. From the simple frosting, to the chocolate filling. 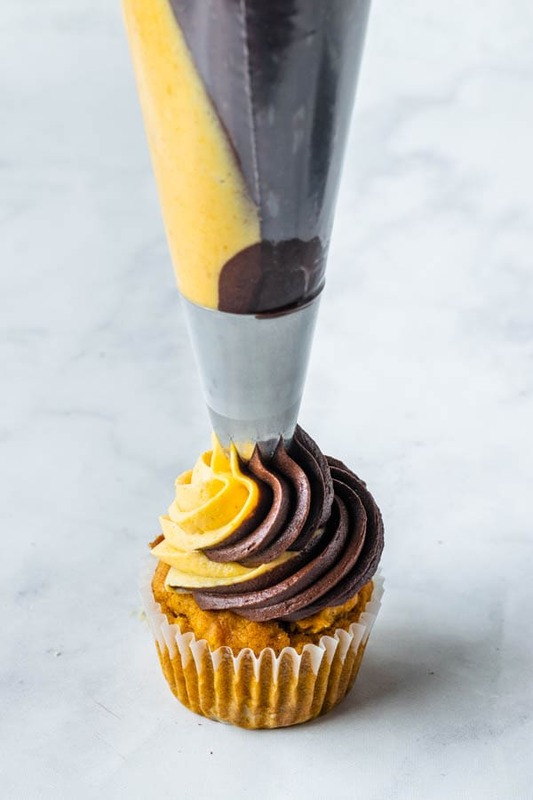 Another thing is that these Chocolate Pumpkin Cupcakes remind me of Halloween because of the dark chocolate and the combination with the orange from the pumpkin. So they could totally be considered halloween cupcakes too. 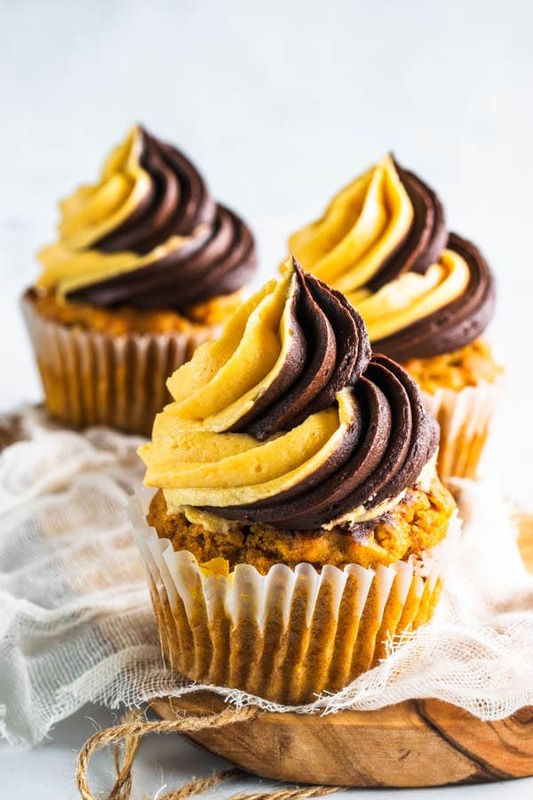 My current status is: looking for someone to share these Chocolate Pumpkin cupcakes with. Since they are in my fridge as we speak, and if I let myself, I’d eat every single one of them. But of course I won’t. 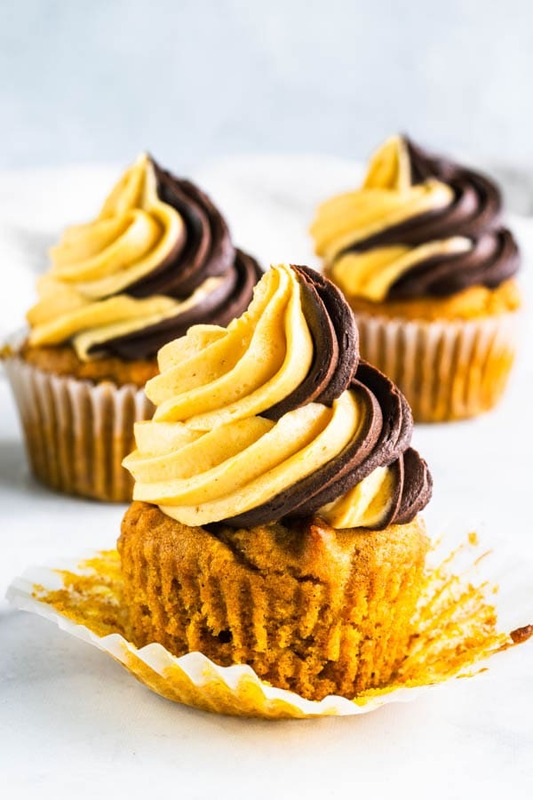 So I need to find someone who likes pumpkin and chocolate so I can share these cupcakes with them. Wish you all a wonderful day. Thanks for reading my blog!! 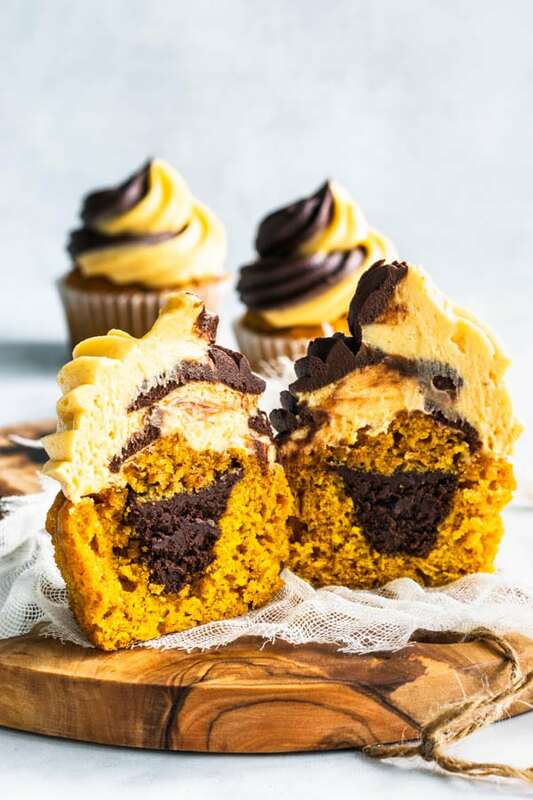 Pumpkin cupcakes, filled with chocolate. 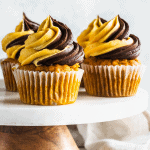 Frosted with a swirl of Chocolate Fudge Frosting and Pumpkin Cream Cheese Frosting. Line a cupcake pan with 12 cupcake liners. Start by sifting the flour, baking powder, baking soda, salt, cinnamon, and nutmeg together in a bowl. Set aside. In another bowl, add the vegetable oil and the eggs. Whisk them together for about 60 seconds. Add sugars and whisk until mixture is incorporated. Add pumpkin puree and vanilla extract and whisk until incorporated. Add dry ingredients and mix with a spatula until just incorporated. Divide batter between the 12 cupcake tins. Bake for 12-15 minutes. When you touch the top of a cupcake lightly with your finger, it should spring back. Cream butter and cream cheese with an electric mixer for about 2 minutes. Add 2 cups of the powdered sugar to the bowl with the mixer off. Mix on low until powdered sugar is incorporated. Then whip mixture on high for 1 minute or so. Add cinnamon, nutmeg, and vanilla. Mix until combined. If frosting is too runny, add more sifted powdered sugar, as needed. 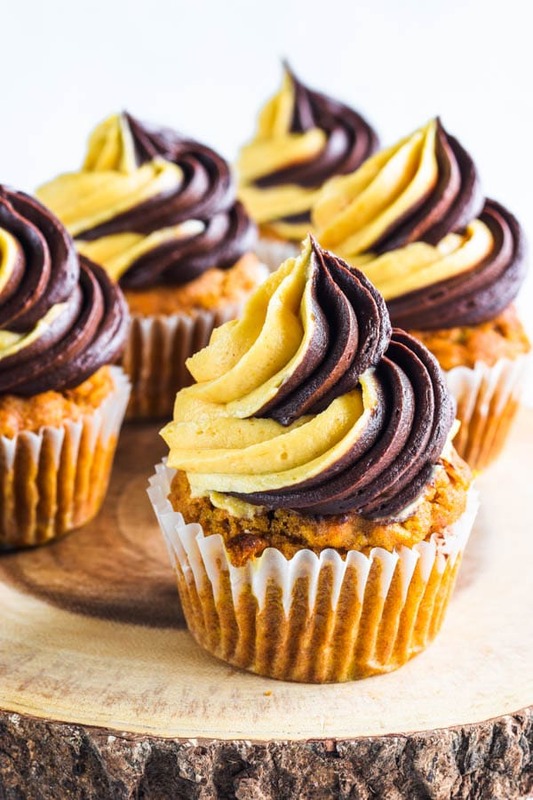 If frosting is too stiff, add a bit of milk, one teaspoon at a time, mixing to check for consistency. Start by melting the chopped chocolate. Let it come to room temperature, or at least cool down to barely warm. Sift powdered sugar and cocoa powder together. Set aside. With an electric mixer, cream the butter and cream cheese together for about 2 minutes. 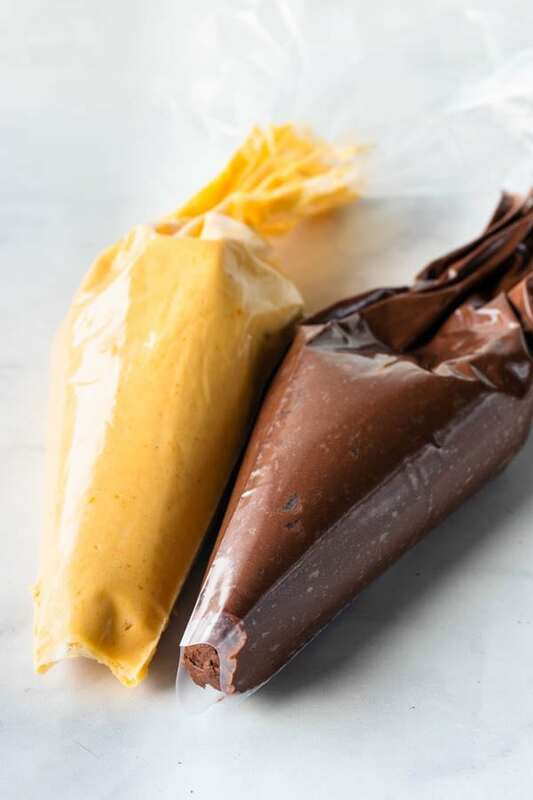 Add cooled down chocolate and cream mixture, scraping the bottom of the bowl in order to incorporate everything together. With the mixer off, add powdered sugar and cocoa to the bowl. Mix on low until incorporated. Raise speed to medium high and cream for 1-2 minutes. If too stiff, add a bit of milk, 1 teaspoon at a time until you achieve the desired consistency. If too runny, add a bit more sifted powdered sugar. Cut a hole in the center of each cupcake, setting the cake pieces aside. Fill the cupcakes with some of the chocolate fudge frosting. Cover with the cake top pieces. Now, place each frosting in separate piping bags. Cut a hole at the end of the bags. 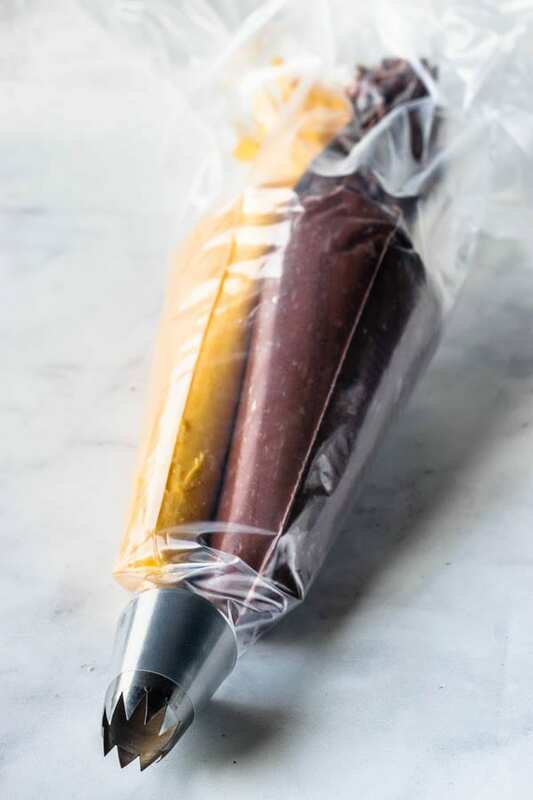 Place both bags inside of a larger bag fitted with the tip you are going to use to frost your cupcakes. This will help you achieve the swirl effect. Look at pictures on the post above to check it out how to do it. Cupcakes will keep well in the fridge for up to 4 days. Se o hominho está de sous chef é garantia de sucesso!!!!! Pratos deliciosos, como sempre!! !